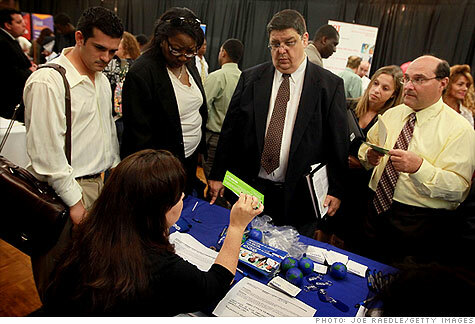 NEW YORK (CNNMoney.com) -- The last thing someone who is unemployed needs to be told is that they shouldn't even apply for the limited number of job openings that are available. But some companies and recruiters are doing just that. How do you view the job situation in your area? That's what happened with numerous listings for grocery store managers throughout the Southeast posted by a South Carolina recruiter, Latro Consulting. After CNNMoney called seeking comments on the listings last week, the restriction against unemployed candidates being considered came down. Latro Consulting refused to comment when contacted. Sony Ericsson, a global phone manufacturer that was hiring for a new Georgia facility, also removed a similar restriction after local reporters wrote about it. According to reports, a Sony Ericsson spokesperson said that a mistake had been made. But even if companies don't spell out in a job listing that they won't consider someone who currently doesn't have a job, experts said that unemployed applicants are typically ruled out right off the bat. "Most executive recruiters won't look at a candidate unless they have a job, even if they don't like to admit to it," said Lisa Chenofsky Singer, a human resources consultant from Millburn, NJ, specializing in media and publishing jobs. She said when she proposes candidates for openings, the first question she is often asked by a recruiter is if they currently have a job. If the answer is no, she's typically told the unemployed candidate won't be interviewed. "They think you must have been laid off for performance issues," she said, adding that this is a "myth" in a time of high unemployment. It is not against the law for companies to exclude the unemployed when trying to fill positions, but Judy Conti, a lobbyist for the National Employment Law Project, said the practice is a bad one. Conti added that firms that hire unemployed job seekers could also benefit from a recently-passed tax break that essentially exempts them from paying the 6.2% of the new hire's wages in Social Security taxes for the rest of this year. Thompson said he also thinks ruling out the unemployed is a bad idea. But he said that part of the problem is that recruiters and human resource departments are being overwhelmed with applications for any job opening that is posted. So they're looking for any short-cuts to get the list of applicants to consider down to a more manageable size. "It's a tough process to determine which unemployed applicants were laid off even though they brought value to their company and which ones had performance issues," he said. "I understand the notion. But there's the top x percent of unemployed candidates who are very viable and very valuable. You just have to do the work to find them." Have you had trouble even applying for a job because you are out of work? If so e-mail us here to tell us your story.